Hit the Reset Button with this 2-Day Plant-Based Meal Plan! I’m so excited for today’s post! Many of you have been asking me to put together some plant-based meal plans or menus – What does a full day of plant-based eating look like? How do I combine easy, healthy recipes into a full day of eating? It’s something I struggled with in the beginning too – and even now, on occasion – so I totally get it. 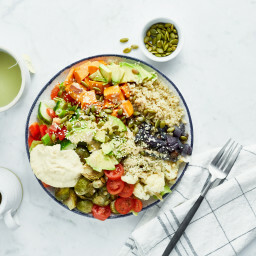 With the summer season in mind, this 2-day meal plan below is filled with healthy, energizing, quick-to-prepare options. All of the recipes (except the avocado sauce and smoothies) can be made in advance and keep well in the fridge. Yes! This post was also crafted for a selfish reason too; I tested cake and frosting all last week for the next cookbook. The end result turned out pretty mind-blowing, but to say I was looking for a bit of a “reset” is an understatement. I try my best to eat balanced, but that doesn’t always happen as a recipe tester. When the dessert chapter needs to be wrapped up, the dessert chapter needs to be wrapped up! So in an effort to bring back balanced meals, I came up with this easy, veggie-packed menu to get back on track. I think we can all relate to this desire now and then, especially after summer holidays and traveling. After just half a day, my energy levels returned and I had a kick to my step again! The power of plants. I hope you enjoy it too whether you follow it to a tee or just mix and match some recipes into your normal routine. 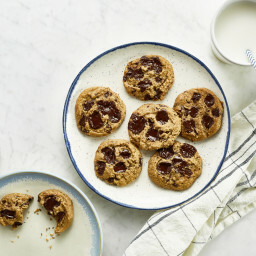 If you are just making these for yourself, you’ll likely have leftovers that carry over into day 3…never a bad thing. Note: All the recipes are linked in the chart below. From there, you can print the recipes if desired. – Lately I start my morning with white tea and I drink it until about 2-3pm. I find it gives me really consistent energy throughout the day (without the crash that coffee often gives me, but feel free to drink what YOU prefer). 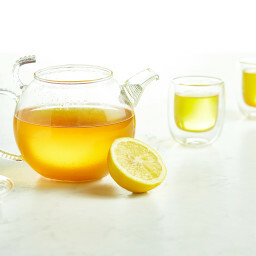 If I’m on the ball I will also try to have some warm lemon water (squeeze half a lemon into a couple cups of warm water – sweeten to taste if desired) first thing in the morning or I simply add lemon slices into a 1-litre mason jar filled with water and sip on it throughout the day. Between outdoor summer workouts and breastfeeding, it’s a constant effort for me to stay hydrated. – See here for a printable grocery list! – All recipes can be made in advance except for the smoothies (I always prefer those fresh as the flavours start to change as they sit) and Avocado pasta sauce. – Be sure to try out my Hidden Greens Chocolate Protein Smoothie – it’s a new recipe to the site and is bursting with nutrients! Not to mention…chocolate for breakfast. You can thank me later. – Please keep in mind that this meal plan is not intended to be a one size fits all plan; tweak and personalize it as you see fit! I often have a mid-morning snack such as hummus and crackers to get me through to lunch. – You can serve the 15-Minute Creamy Avocado Pasta with whole-grain pasta or zucchini noodles. I use this spiralizer to make zucchini noodles. It’s a great summer option! Well, this was a beast of a post to put together so if I’ve forgotten anything feel free to let me know. Do you like these kinds of posts? I’m open to your feedback as always. Wishing you boundless energy this week and all summer long! I just hit the refresh button by accident and when I did there was a new post! How exciting is that! haha :) Thanks for your excitement! And now that I read it, love this style post! Always interested in what a typical day of food looks like for others! Would love to see posts like this again in other seasons too! Although with the weather on the east coast this week, I could use a hardy fall/winter menu right about now. Angela I totally agree this post is Soooooo Exciting. Especially since our garden is in full swing and there is not shortage of veggies here! Thank you for including a dessert as well! I always need a little something special at the end of my meal. Hope you enjoy Tom :) ps – so jealous of your veggie garden! I used to have one in our previous house…miss it dearly! Toms wife here. I’m so excited that he is excited about this new plant based meal plan. Dr. Says he has super high bad cholesterol! Very worried. He Needs To make changes. Our 5 year old is worried he is going to die. And he doesn’t even look overweight or unhealthy. That’s why you just have to eat healthy! Lauren i completely sympathize! I just finished my 1st trimester and have hardly been able to eat any veggies. This post gives me hope and inspiration that my healthy taste buds will come back soon! Hi Angela, that sounds like delicious and healthy 2 days. Thanks so much for this. All of the recipes look delicious. 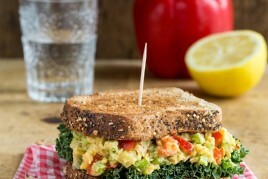 I’m in need of a reset as well and can’t wait to try that chickpea salad!! These look SO good they don’t even look like detox meals! YUM! Thanks – this looks great! my Mom is coming to visit this weekend and i’m definitely going to make all of these for us. Love this post and am excited to try the smoothie as well! Thanks for your enthusiasm. I’m so glad you’re enjoying everything. Ugh love this meal plan. I’m not vegan or even vegetarian, but lately I’ve been craving (and eating) sweets and junk food to the max, and this looks like just the thing to reset. When I hit refresh, nothing happens. Any ideas on why I can’t see the chart? Hmm I’m not sure – which web browser are you using? I’ll look into it! Google Chrome. I’m hitting the refresh arrow and the same page reappears. I use Google Chrome too and it’s showing up for me. Strange! I really don’t know. Did you try another browser or device? You can try hitting control + F5. Sounds perfect for someone needing a little change in their diet! I love that it includes snacks! So many ‘diet plans’ you see out there are so restrictive! I love this post!!! I’m a (control freak) meal planner, so I love love love new ideas for balancing the days. As a bonus, we also find that meal planning really helps keep our young kids motivated to try new foods all the time – they know what’s coming and they also love to help with the planning. Your reset button will kick off next week’s plan – thank you! Thanks for such a great post Angela! I’m sure this took a ton of work! I have already sent this to one of my clients who was needing a reboot after vacation. I really appreciate it! This is such a great post! Particularly excited to try the creamy avocado pasta! I definitely need a re-set and this is helpful, thank you! Can’t wait to use this! So helpful :) and it all looks mouth watering! This post is AMAZING! Love it, love it, love it!! Love those posts! Even if I won’t follow them completely they are a good inspiration! Just got your cookbook and just found your blog and I am loving all of it! You’ve made cooking healthy easy for this single mama of three kids. I am so grateful! Fantastic post and a great way to get the diet back to normal after a summer of splurging. Love this blog and your first cookbook– anxiously looking forward to the next one! Angela, thank you very much for this. This is the first time I’ve commented which is a bit silly of me because I use your recipes from this site and your book daily. You have helped me so much and for that I am truly thankful. I LOVE this post! I just sat down to make a shopping list and menu, so this came at the perfect time. I’ve been in a rut with the things I’m eating lately…just eating the same things over and over and I know this will help shake it up. Thank you!! Thank you a hundred times over! Your recipe book is a staple in my household! My husband aka food tester came home from work yesterday and said “I recommended oh she glows to someone at work.” He loves the recipes a fee make them 3-4 a week. Thanks for having food that even a cautious man can love! Thank you for everything you do for all of us struggling out here! ahh that’s so cool! Thanks for letting me know. :) I appreciate your kind words too! I love these kind of posts, since I always wonder what healthy vegan people eat in a day. And this is perfect timing because I’ve been wanting to ‘reset’ my diet, too. All the recipes look delicious, and I can’t wait to try them! Thanks for posting this! Thank you so much for this post – I certainly like it. I appreciate all the work that you put into this…I know it’s a lot!! Everything looks yummy and appetizing to everyone! Thank you for this post! I’ve been wanting to explore more plant based eating, but with two little ones and a business to take care of, the food prep needed for all the veggies seems very intimidating (and time-consuming). I’m glad to find some of your easier, faster recipes available in one place. YAY! Then of course I found your quick and easy tab…. This looks like a do-able meal plan for me. I may just try it. Thanks for the printable list. that chocolate shake was soooooo good! slurred it down really quick! also, I am in love with those glasses in that post— I have to ask where they are from?? I’m not sure there is a polite way of saying this….. 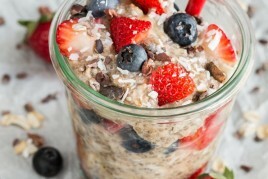 But on day two if someone new to chia seeds had them in the overnight oats and smoothie (3TB) and then had the chia pudding for dessert, the after effects could be rather unpleasant. It’s just a lot of chia seeds for one day! Thanks Angela! This post was perfect timing for me. In fact, I’d just made your Black Bean Quinoa Salad w/ cumin and lime about a week ago – so refreshing and I felt virtuous just eating it. I get that this is just a 2-day “reset” menu, but would love to see more meal plans/shopping lists for a week at some point in the future – though I know your hands are pretty full right now (:. I’m probably like many in that I find myself “winging it” more nights than I’d care to admit. I love the lunch ideas that you’ve done in the past, too. Oh, you just blew my mind away! I don’t really know how you do that, but even though I’m eating plant-based and mostly vegan, and have been for quite a long time, and therefore dishes like these are very familiar (and I already know how much I love them!) but STILL I’m getting all excited and inspired!! I love all this stuff so much already I didn’t know it was possible for me to get anymore excited and enthusiastic but you did it (again)! Haha, it’s so funny (and wonderful) how you can get so inspired about something that’s been your lifestyle for a long time! You just do something magical — you’re amazing, Angela! Thank you so, so much for your posts and your blog, they bring me so much joy!! So I just had to tell you that! Thank you so much for your kind words! I’m so happy your excited about the post. I wanted to let you know that you were mentioned on the RICH ROLL podcast by NFL player David Carter. David mentions OhSheGlows towards the end of the podcast as a great recipe resource for someone looking to start a plant-based diet. Congratulations on the success! LOVE this idea, thanks for the work on it! Great idea. Thank you for this, Angela! I was vegan for years (and have celiac disease), then when I started my current job 3 years ago I slowly began eating dairy again (out of stress), which was a bit of a gateway drug to eating fish, poultry and lamb again, after eating no meat for 28 years (I became vegetarian at age 7 then vegan at age 11). Your recipes have helped me get back to who I truly am– a vegan. I begin yoga teacher training in September and want to be in the best health before I begin– your recipes and this two-day reboot are helping to make all the difference for me. Thank you for being so generous with sharing your recipes and your personal experiences! I love your cookbook. I even take it when I travel. This post really inspires me — very helpful! Thanks! Thank you for this. I so need to get back on track. I’ll have to switch up the quinoa dishes though. I am trying so ever diligently to like quinoa but it just doesn’t sit right with me. I think it’s a texture thing. What are some of your other go to grains? Have you tried buckwheat or hulled millet? Both gluten free and a little more chewy than quinoa. When this landed in my email box this morning I thought I was going to see a price tag attached at the bottom – I think it’s very generous of you to provide this for free, with all those great recipes and tips. Thank you! Angela~It’s posts like this that make us keep reading year after year. Thank you!! The best part of this plan is how all of the recipes are free and accessible for your fans. It is obvious that you care about the health of our society as a whole. Looking forward to the next cookbook!!! Great idea!!! You GO GIRL!!! I respect that you didn’t fuss or add allot of fancy ingredients for those that are getting started or trying to add more plant based foods to their diet – these are straight forward and easy enough to prepare and source for ingredients – you were thinking even with all that you have on your own plate!!! I have been eating plant based since March and DOVE straight in! Yours was the FIRST cookbook I purchased and have been enjoying your blog posts and email updates and many of your recipes every since. Love these kind of posts, even though I’m in Australia so wrong season for me. Bookmarking for our summer :) thank you for the inspiration! If you are planning more posts like this I would love to see lunches and snacks that could more easily fit into weekday meal plans. I find soups and smoothies aren’t the easiest to pack and take with you. Yes yes yes!!! Love this post & love you! Thanks for sharing! Thanks for putting this together! I love your blog and your cookbook is full of so many no fail favourites. Can’t wait to try this meal plan. They all look so yummy. I especially can’t wait to try the Avocado Pasta and probably won’t wait. It’s in the plan for tonight. Thanks so much for all your hard work and yummy recipes. This post came at just the right time! I am a teacher and just finished summer school (which is crazy busy) so I’ve been eating like garbage, and starting to crave garbage to eat. My plan was actually to eat only food from your cookbook next week, but it’s exciting to have this meal plan to follow. I love your recipes. I am vegetarian and consider going vegan. Meal plans with grocery lists would be beyond amazing! Meal planning is a weak area…I would LOVE help with it! Please post more plans! This is so helpful! Thank-you for putting this together and making life easier for the rest of us! I love it !!! My day goes a lot better when I have a structured meal plan. Thanks for the Classic Monster Green Smoothie, I’m looking for new smoothie ideas! I always come to your blog when I have new ingredients that I want to use in a fun way (garden-fresh cabbage today! ), and today I discovered that the search bar on the site is not working properly. Wanted to let you know! Thanks so much for letting me know. It should be fixed now. Hooray! Hooray! Hooray! A new blog : ) Gosh, I just love your blog. I go here when I want to feel at home and at peace with the world. Thank you Angela! LOVE this! I enjoy eating vegan meals but I know my husband would prefer to have some sort of meat on the table. I’m always looking for new meals to add to my “wow, this is vegan? It’s so good!” recipe stash. Sometimes when I aim to eat plant-based meals for an entire day, I wind up eating a lot of toast. This is amazing! My husband and I need this for a post vacation reset. Thank you so much. Would love to see more of these! I love the fact that you shared this. You have such a wide audience and this is so needed. I had to laugh when you posted this because “hit the reset button” was exactly the wording I had on a program I launched earlier this year.I’ve changed it up a bit to call it a diet reset program and I did a free 3-day one and then I have a 3 week group program for people that are looking for more. My take is that the more of us out there spreading the word about plant-based nutrition and the benefits and helping people incorporate it into their diets in a simple to understand way, the better. Great job Angela! I LOVE love LOVE your emails!! Can you add the calorie / carb / count to your recipes. I am sure so many of us look it up, it would really help! I love this post! So thorough, inspiring and useful! Thank you. 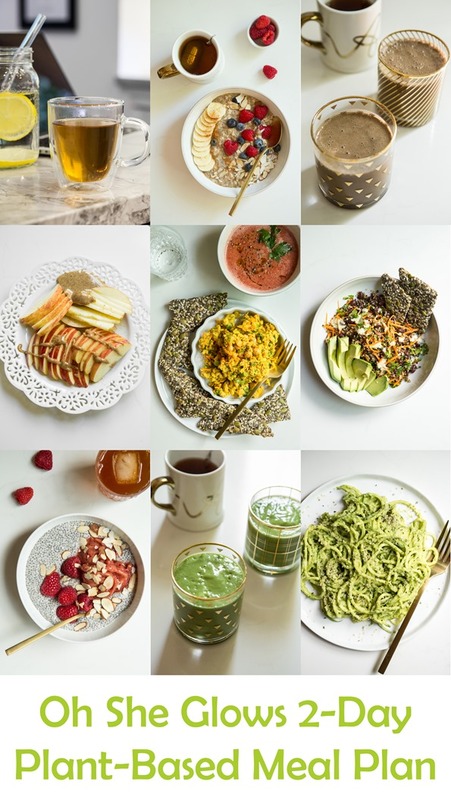 I bet this post took a lot of time to put together, but I think readers really enjoy seeing what one day of eating looks like! I’ve tried many of the recipes you used in the 2 day plan and enjoy them all! These meal plans are an answer to a busy woman’s prayer. Your recipes are tasty and easy to prepare as well as simple to tweak. Thank you for all of your hard work! I love this post! As a new vegan, I struggle with figuring out what to eat for breakfast, lunch, and dinner on a daily basis because I do not know much about plant based diets. Your meal plan is very helpful. I really hope that you can do more plans in the future. I love these kind of posts! Anything that I can fit into a meal plan to minimize the mental energy required to come up with one in the first place is AWESOME! I’m so excited about this post! I love the shopping list, the beautiful pictures, the recipes of course, just everything. So much detail – so appreciated. Will definitely do this next week, exactly as you have it written out (well, except for the kelp in the crackers – that’s the only thing I’m not in to but otherwise, it’s like you have my taste buds!). Love this post, can’t wait to shop and get started. Having a hard time getting motivated to meal plan these days with a busy baby at home, you are an inspiration! Any plans to share some plant-based baby favourites /make ahead meals? Our 10 month old eats a lot of what we eat but would love some ideas! Thanks so much for posting this! 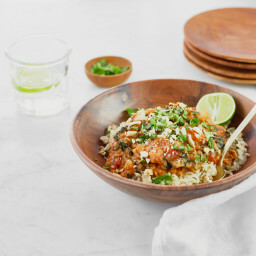 I can’t wait to try some of these recipes as your photos look amazing! Made the smoothie today, used some soaked oats instead of avocado (allergies), and collard greens instead of kale. Turned up perfect, almost dessert – like. I always mix greens with fruits thinking the taste is best masked that way, but this was a revelation for me, the cocoa powder seems to mask everything so you can barely detect there are greens in here. Thanks again for a great recipe and a great meal plan! Started this meal plan today and love it :)!! Thank you for this post! I’ve been struggling lately with figuring out fast, easy, and healthy meal plans. This helps a lot!! This type of post probably takes a lot more time to write and put together, but I would love to see one for each season. I love these kinds of posts with the total meal plan and grocery list! Makes my life easier. Keep them coming! Love the plan. And the pictures of your food, as always… MESMERISING! I know that you hear this all the time, but you have changed my life! I discovered your blog about a year ago while looking to add more vegetarian meals into my life. I’m a 28-year-old living in Las Vegas, Nevada, and I don’t even know anyone who is a vegetarian, let alone vegan! When I started cooking your recipies, I realized that I didn’t miss the meat or dairy. I started looking into health research and visiting other plant-based blogs. This summer I decided that I wanted to try going vegan/plant-based, and I have made it two weeks with only a few difficult moments! I just wanted to let you know that I think you are an amazing person with a crazy ability to get anyone to consider a more healthy diet. Please ignore all the negative people who are trying to bring down your beautiful glow. I look forward to many more inspiring, healthy, delicious recipes! I loved this post sooo much! Gives me so much inspiration and ideas, thank you! Really great post! Nice to see an individual plan that shows just how easy it can be to make healthy meals! Also love seeing what other health-minded people are eating. :) Thanks so much for sharing. Love your site! Angela! Thank you for sharing this and thank you for having time to write posts on blog. I’m not a vegan, nor even vegetarian, but I really like to incorporate some plant-based recipes in my daily meals. However I have been overdoing raw treats, so recently I have cut out those from my meals for a while. :)) As you know healthy doesn’t mean low calorie – oops! :) I will definitely try your meal plan soon! Thank you! Every recipe (as usual) looks delicious! Vegan meal plans are typically hit or miss and this looks to be right on target. I can’t wait to try every recipe! Thanks so much! This is great! I just got back from a mini trip and am definitely in need of a reset! Hi angela, this is a good post to read. Thanks for putting this up beside creating a new book. You must be swamped with works. it will be all worth in the end! I love that your chocolate smoothie doesn’t call for protein powder! I’m too cheap to buy it (ha!) and would rather eat real food anyway. Thanks so much for sharing this! I’m really excited to have this on stand-by when I need to re-set. I’ve done pretty well this summer so far (my appetite changes drastically with the hot weather, leaving me craving veggies and fruit and I have been shying away from ice cream more than usual), but know this will come in handy when life gets crazy, the weather gets below zero and my body thinks it needs to pack on the fat to get me through the winter, or over the holidays. Even though I’m not a vegan (not even a vegetarian), I do like to eat plant-based throughout the week, especially in the warmer months, and love your recipes! I have yet to try a recipe of yours that I didn’t love. I have your cookbook and come to your blog regularly for recipe inspiration, but I stopped by today specifically hoping that you might have meal plan posted somewhere. Lo and behold, my wish was granted! I’ve made a couple of these recipes before, and most of the ingredients are in my pantry, or easy to pick up. Thank you for a perfectly timed post and a wonderful combination of delicious food that I can’t wait to eat over the next few days! i Know that some vegans eat honey and some do not, I am a new vegan and still eat honey what is your opinion? Angela, Angela, Angela, LOVING this post too! In the last 2 days I’ve made the hummus, gazpacho, and the bean & quinoa salad. all DE-LICIOUS! 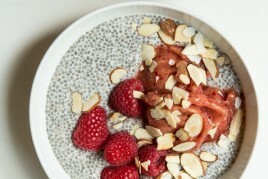 I’m craving a sweet treat so going with the chia seed pudding tonight. All great recipes, love eating good food without the guilt. Please do more of these kind of posts! 2 days detoxing is not too scary for my husband and still long enough for an energy boost. Have always loved that chickpea salad from your cookbook and I just made the gazpacho- SO DELISH! I’ve never liked any gazpacho that I’ve made before and I’m so looking forward to eating it for lunch tomorrow! Thank you for the loveliness you create! 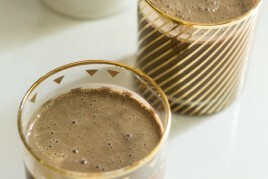 I tried you Hidden Greens Chocolate Protein Smoothie and absolutely loved it! This was an amazing group of recipes – I have been looking for a great meal plan for my 12 year old daughter who has had digestive issues since she was born (the doctors have found nothing wrong). I am not a cook by any means, but when I am given a bunch of recipes and a grocery list, I can do anything! After Day 1 my daughter woke up and said, “I don’t feel as tired as I normally do – I have a lot of energy.” She also finished Day 2 and loved the pasta with avocado sauce (I did too!). I felt a little “peckish” on Day 2 and made the truffles from your 10 recipe bundle to satisfy my craving for something sweet, and the whole family loved them (including my husband and 14 year old son). I would happily pay for more meal plans and grocery lists – anything to make life easier – thank you so much for all you do!!! What kind/brand of white tea do you prefer? I love trying new teas! I totally love these kinds of posts! I have been adding plant based foods to my diet more and more over the last few years, but when I’m tired and busy I default to what I was raised with. God bless you for including a shopping list!!! Your 2 day all day reset plan a gift. Am a new plant-diet convert – 7 days. Feeling thrilled with vegan food – loved your linguini avacado receipe. Yet perplexed about what one eats for a whole day. and your reset plan tells me. Also didn’t realize snacks OK. WOW! I’ve been eating like this the past two days, except for the Avocado Pasta (trying to use-up the leftover salads first) and my stomach is nice and flat. This surprised me as I really thought the beans would bloat me, as I thought they normally do, so now I’ve got some things to figure out! What I especially wanted to say in my comment though is how great these recipes are. I’ve looked forward to every meal and don’t feel one bit like I’m missing out. The chickpea salad and black bean salad were both so great and my favorites were the gazpacho and the crackers. Together with the salads, it’s just perfection. (those crackers amazed me with how good they are!) Thanks again for all your work on this – it’s got me back to cooking and feeling great. Such a great post, Ange! I’ve been eating more plant-based than ever recently, and I always like seeing how others (especially you!) so it as well. I’m excited to try some of these recipes! What a great post! We all need a reset sometimes. I used your meal plan and everything was amazing (the crackers are great with Matt’s Buffalo hummus) except the gazpacho. I used plain roma tomatoes and it came out with a really thick layer of froth and I didn’t get much tomato flavor. I think the tomatoes were my problem. What kind is everyone using? This was absolutely wonderful. I was amazed at how much I learned about my own cravings and impulses. Please, more like this!! I just decided to come back to your recipes after a while of trying other styles, because your recipes are not only delicious, but they make me feel good. I love the meal plan including the shopping list. Because not squeezing in the time to plan for my food has often been the reason I retorted to buying food, which is more expensive, more repetitive, less delicious, and doesn’t make me feel that good. Followed your plan after returning from camping, and feel grrrrrreat! Everything was delicious. Thank you! I am in so need of a reset and yours looks great. Easy, which is important right now, but food I’ll really enjoy eating. Perfect timing for me. You know you could so do a book or an e-book of one day recipes ( a lot of them and in different seasons) with accompanying grocery lists. I know I can do it myself but don’t spend the time to do it- then often end up not being satisfied with what I eat. A month ago, my boyfriend of 3 years left me out of the blue. In an instant, I lost any desire to engage in two of my greatest’s pleasures: cooking & eating. I became a “fast food vegan,” surviving off of processed options that were effort-free, bland, and palatable. It was what I needed to stay upright, and I met this need with self-compassion. This morning I woke up with a new need: a need to reset & rediscover the delights of good food! I knew exactly where to turn :) Your blog has long served as my pick-me-up, not to mention a treasure trove of tasty inspiration! I was so happy to find this post, so I dragged myself to the grocery store for the first time in a month & spent the afternoon in the kitchen :) When I got home I released I’d forgotten to buy veganaise, so I subbed out the Chickpea Salad for your Lightened Up Protein Power Goddess Bowl. I also decided to adapt the coconut milk-based overnight oat parfait with what I had at home, swapping in cloves instead of cardamom & cherries instead of blueberries. Very helpful ! Thank you very much. I’m just in love with your recipes! Your cookbook has made transitioning to a vegan diet so much simpler for me. Not to mention, that my die-hard carnivore of a boyfriend has recently started cutting out meat as well. Keep up the amazing work! I completed this meal plan! Yippee!! Please, more meal plans with grocery lists to come!! I am a 21-year old nomad who doesn’t actually usually have all the ingridients to your recipes, and makes grocery stops for 1 or 2 ingridients just to be able to complete your great recipes, so I really appreciate the grocery lists. Also, could you make a blog post about all the ingridients one should have in their kitchen at any given time- and appliances, too? I am about to move into my FIRST PLACE and would love some of your guidance. Thanks! Thank you for this meal plan! I followed it the weekend after you posted and it was fabulous. Please keep making meal plan blog posts! This one got me out of a rut and inspired me to keep making meal plans. I also found that your smoothies really keep me full and full of energy, something I never believed smoothies could do, so much so that I bought a Ninja and make smoothies 2-3 times a week now! Thanks again! I book-marked this post and was eagerly waiting for my annual leave to start so I could do this 2-day “resetting” plan. Finally, my holiday starts tomorrow and so does the plan (I did my food shopping today,) and I am SO looking forward it. I love these kinds of posts! This was perfect timing for us! Working with my young daughter naki g a grocery list as I type this and this is perfect!!! Hello. Greatings from Slovakia. I would like to thank you also for this post, many others and all the recipes. They are working! And the taste….! Delicious! Because of healthy issue I have to take care what I am eating. Your recipes are in the line with my special “diet” . It was very hard for me as I never did vegan meals before. I didnt know how and what to combine to have great taste. But this was only till that time when I discovered your book and blog :-) So MANY THANKS for everything. And am now 90 percent vegan. I am in love with the recipes and slowly pulling my hubby to the green side. I have my own Gyrotonic studio in Ottawa and teach/ work out 5-7 hours a day. Since becoming “vegan”, my energy levels are more balanced. Awesome! Can’t wait to try this! I’ve been meaning to try a plant based diet for a while now. Thank you, Angela! I appreciate the hard work you put into this post, and the grocery list is so helpful. I have two dishes completed and hope to finish the rest before bed. My week will start healthy with minimal stress. Thanks for being amazing! LOVE THIS POST!!! you. are. amazing. Thank you for this post. I’ve been sort of desperate for a plan. For different reasons and instructions from my naturopath a TON of my favorite foods need to be eliminated or drastically reduced. Meat, milk products, eggs (sob!). I would love to see a few more eating plans. Then I could have three of them including this one you posted. I’m so good with eating the same thing for days as well. Congrats on being a global success!! PS: if you have any suggestions for smoothies without bananas or a banana substitute in your smoothie recipes. They are so good in smoothies but can you believe they were THE HIGHEST on my food sensitivity test!? I may just starve, lol!! I love this post more this week then I normally would. I just got back home from a 2 week backpacking trip & all I want to do is get back on track with my eating. Some of the recipes I have already made many times & love them. Thank you for all your hard work. Your website & cookbook are #1 in my house…even non vegan eaters! As someone about to head back to school where the only eating options are Pizza Pizza or Tim Hortons, I’m so excited to get these meals prepared for the first two days. Favourite post yet! Excellent meal plan, I will keep in my portfolio, I will put it into practice. Greetings! Truly inspirational! A friend recommended your book and I love the recipes. I have been flirting with being vegetarian and now with your recipes and finding how delicious everything is a true blessing. Thank you Angela! Great meal plan, Angela! I cooked everything yesterday and started Day 1 today. Just a quick suggestion – you may want to add the apple and berries (or other pudding/oatmeal toppings) to the grocery list. I am absolutely LOVING the black bean/quinoa salad and the crackers! Such a great post !, It actually reminds me of a youtube channel that shows you how to cook healthy and easy meals. Your favourite meals that you couldn’t even imagine they would have a healthy version ! Wow. I just did your 2 day reset plan and it was fantastic. But now on day 3 i dont know what to eat. Please a 5 day plan ? Please. Vegan wannabe. Your Posts Is Really Exciting… Its Super Duper For Vegetarians. I Myself Find It Interesting. Will Definitely Give A Try. Love the grocery list. This is perfect. Now we just need one for each week and I’ll never have to go to another blog again!! Love love love your recipes. Thanks for this wonderful meal plan! I began eating vegan over the summer, and now that school is back in full swing (I’m a kindergarten teacher!!) I really need to hit the reset button! Love your blog, thanks!! Thanks for the meal plan! I love this. Your recipes are delicious and easy to follow and this is a huge help to simplify weekly meals for our family. Hi, I love all your recipes! I do have a question, I am not fond of bananas :/ Do they have to be added to smoothies or is their a substitute to use? I love your post! I would reallly love to see a full week plan of plant based eating with a grocery list to make it extra easy :) Thanks for all your wonderful recipes! Thanks for your support, Mandy! I’m glad you found the post helpful, and I hope you absolutely love the app. Just adding that I love meal plan posts like this and would totally use others if you make them. This is exactly what my husband and I were looking for to clean up our act after a week of vacation. Thanks! Will you ever consider more meal plan posts? Love them ! Or meal plan app? Yay I see it now on my PC. For some reason it did not show up when viewing on my IPhone. I can’t wait to start, thank you so much! I’m so glad you can see it on your PC…thanks for letting me know!